When I saw these cookies over at Confectionary Creations, I knew I had to make them. The perfect cookies to bake for my mum on Mother's Day. They were really delicious! Light, chewy and almost cakey in consistency. The cranberries and orange peel really enhanced the flavour of these cookies. I might even add a bit more orange peel next time. Thank you for the recipe Elyse! Mum gave them the thumbs up. She really loved them! Update: I have removed the links to the original recipe as the site sadly no longer exists. Instead let me direct you to an even better cranberry cookie. This one has white chocolate, but you can easily leave that out and add in finely grated peel of 3 oranges to get the flavours of this cookie with a softer, more chewy cookie. Yum! I adore cranberry and orange cookies and for some reason only make them at Christmastime. 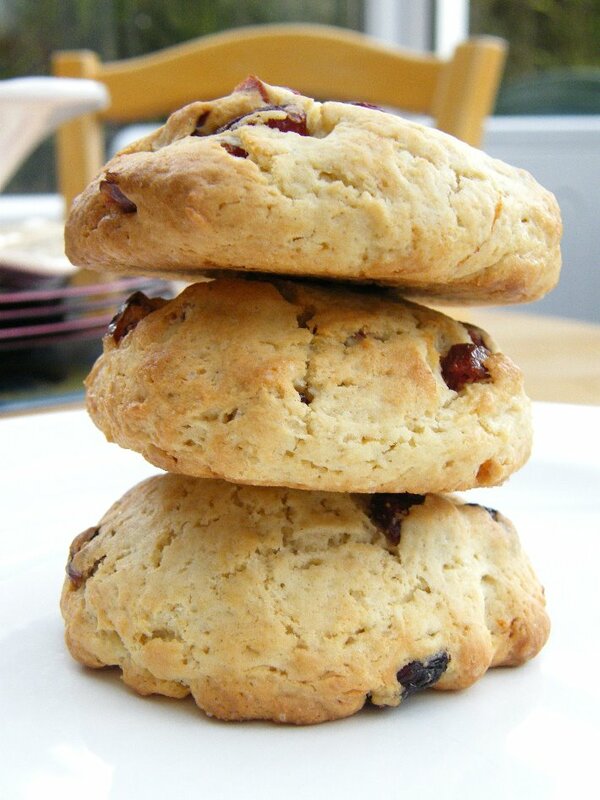 I like a combination of orange and cranberry..your cookies look a bit like scones..:) nice texture ! Yay!! Holler, I'm so glad you made them. Yours turned out so beautifully--I think your pictures are totally better than mine!! And you even got the thumbs up from your mom--how fabulous!!!! Mmm, I think I need to go have a cookie now; I'm hungry. MMMM they look SO good! I want one right now. No, two. No, three! Can you tell I'm craving cookies? And these look just perfect! My absolutley favorite flavors! nothing can beat the refreshing cran orange! Beautiful texture & mum approved too!! I love dried cranberries, better yet in a cookie. They look great. My friend Jo-An makes a version of this with chunks of white chocolate and cashews. They're the kind of cookie you can have about one of per year -- but I am a lemon/cranberry addict, so it seems like I'll have to give these a go! It's been a while since I have made cookies and now I'm craving some. Lovely recipe and beautiful photos Holler. I love the combo of orange and cranberry - not just for the taste, but the colors are so pretty together. Your photos are always so engaging! This is the first time I have tried this combination before Diann, I seem to have missed out on something that everyone else loves. Pity I can't just pass you one Ricki! The leftover cookies were scoffed at work today. I left them in the staff room, came back an hour later and they were finished. Hi Soma, I really have missed out on this flavour, but I will return to it again. Hi CC It was nice when you can across a little juicy, chewy cranberry. Yum! Hi A & N, I just came off the phone with my mum and she has eaten 2 more of them and is fearing for her waistline. He he! She does love them though. Hey Tanita, White Chocolate and Cashew sounds amazing. I think I could scoff far more often than just once a year. I am going to scribble this one down! Thanks Anne. They didn't spread much at all during cooking, but were lovely and light. I love the combination of cranberry and orange! Oooh, cranberries and orange have always made a nice pair. We've had muffins and bread, so why not a cookie?! You do have an affinity for that cranberry orange combo... and I love that about you! These look delicious, and I love the hints of red from the cranberries, so pretty! I adore cranberries, they turned out beautifully! I have totally missed out on this combo Alex, where have I been? Oh wow, these look so delish and my boys would LOVE these!